Here's one last Robodex Guidebook scan. I am not sure whether I hope or fear that there is chicken involved somehow. It's not a natto burger. At least, I don't think it's a natto burger -- it's hard to tell. But I still wouldn't want to come upon one in a dark alley. basically, its fried chicken cutlet on flat bread with curry sauce. It looks good to me. Two please...and a large Sapporo! 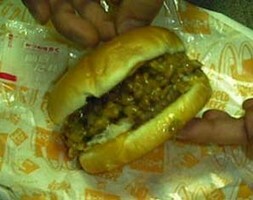 By the way, Mike Hannemann was the guy that first said "mmm, natto burger...". 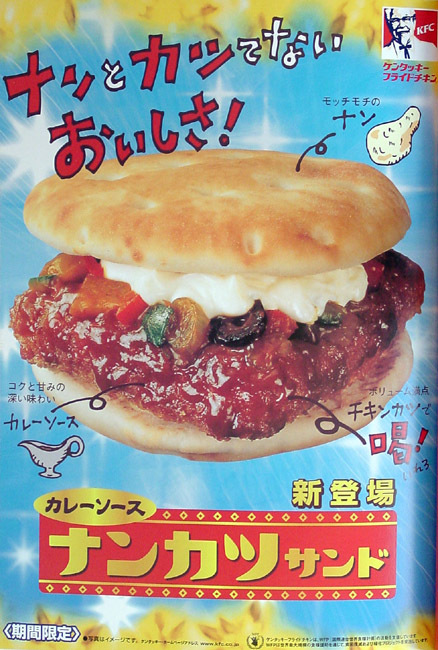 I would rather vomit than eat a natto burger. Same thing, really. Don't worry, same here. I draw a sharp distinction between "food" and "eldritch horror", and natto falls into the second category for me.